Reigning rally world champion Sebastien Ogier (Volkswagen Motorsport) is one big step closer to his second victory at ADAC Rallye Deutschland after Saturday’s nine special stages, of which he was the fastest six times, and he increased the lead ahead of his team-mate Jari-Matti Latvala to 33.8 seconds. Four stages are scheduled for tomorrow and it’s hard to expect that Ogier can lose the lead. Decisive Saturday stage was a marathon speed test Panzerplatte Long (45.61 km) on Baumholder military area. Ogier was the fastest in both runs and collected a 22-second gap. “It was a perfect day. We made most of the difference in Panzerplatte and that was the key to the rally. We had the right set-up and tyre management, but it’s never easy without split times because you never know where you are with the rhythm,” said Ogier. 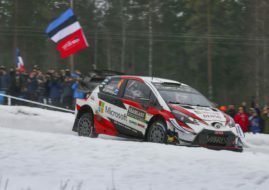 Latvala won three out of nine stages but against Ogier he had no chance to do more. Third Volkswagen driver Andreas Mikkelsen defended his third place and finished the day a further 1min 13.7sec behind Latvala. The Norwegian felt comfortable enough to test a different differential this afternoon in preparation for the season’s remaining asphalt action. Hyundai drivers Dani Sordo and Thierry Neuville continued to fight for fourth and swapped places two times. At the end of the day Sordo’s advantage is 9.5s. Elfyn Evans was sixth, as he was the day before. His teammate Ott Tanak lost 7th place after going off road at the second pass through Panzerplatte and fell to 8th. Mads Ostberg made a progress to 7th and finished the day just 3.2s after Evans. Hayden Paddon (Hyundai) and Citroen’s World Rally Car debutant Stephane Lefebvre rounded top 10. Robert Kubica retired after damaging the suspension and rear left wheel on his first pass through Panzerplatte.